Delivering power when you need it, the Mighty Max ML12-6F2 6 Volt 12 AH uses a state of the art, heavy-duty, calcium-alloy grid that provides exceptional performance and service life in both float and cyclic applications. The ML12-6F2 is an Absorbent Glass Mat (AGM) technology with a valve regulated design, that can be used in enclosed and indoor environments without leaking or maintenance, providing a superior performance for thousands of models. Dimensions: 5.94 inches x 1.94 inches x 3.82 inches. Terminal: F2. Listing is for the Battery only. No wire harness or mounting accessories included. SLA / AGM spill proof battery has a characteristic of high discharge rate, wide operating temperatures, long service life and deep discharge recover. Rechargeable battery that can be mounted in any position, resists shocks and vibration. Long lasting high performance in high and low temperatures. Backed by a 30 day refund policy and full 1 year warranty. 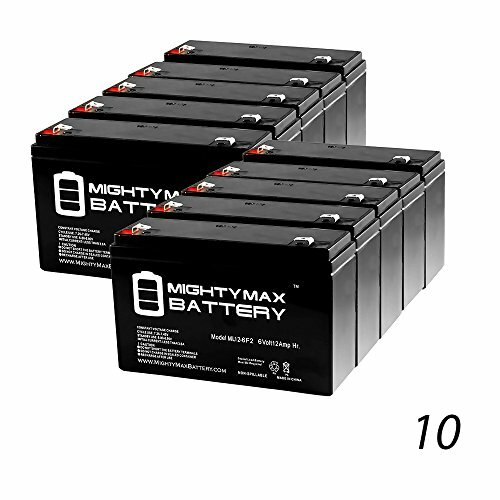 If you have any questions about this product by Mighty Max Battery, contact us by completing and submitting the form below. If you are looking for a specif part number, please include it with your message.